Yesterday I mentioned The Tale of the Water Pit, and I know you’ve all been just salivating for it, right? 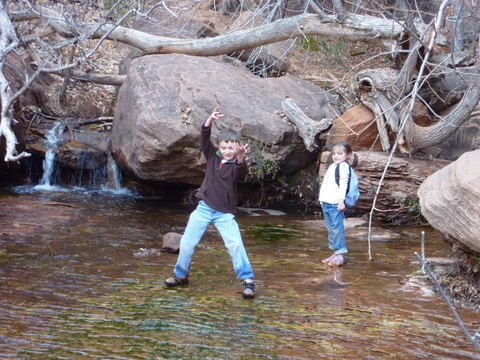 Brian and I have taken the kids on many hikes, and we’ve never had any major incidents or mishaps, UNTIL . . . It started out as an ordinary day in Capitol Reef. We walked through Capitol Wash, and then up a spur trail that leads to the Tanks. They are big pockets in the rock that fill with water. Ohhhh, you say. Water tanks. Right. They are very important for desert ecology, etc. etc. And we saw some interesting water gliders in this one. HOWEVER — the edge of this tank was tricky to walk around, so I decided to stay behind with William while Brian went ahead with everyone else. And on the way back — eek! — Eleanor fell in! Right in the deepest part of the water tank. Which, fortunately, only went up to her waist, but still. The water was freezing, and it was the halfway point in the trail. 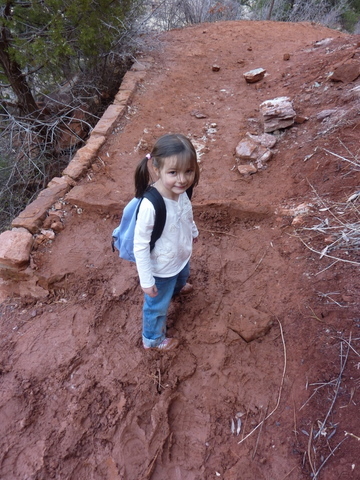 This meant that Eleanor had to hike all the way out of the canyon with wet shoes, socks, and pants. Poor girl. She was brave about doing this, but she kept up a steady stream of complaints the whole while. THEN, right after leaving the dreaded Water Pit of Whine, William began to squirm about in that traditional dance that means a bathroom break is needed. We found a nearby bush for him to do his business, and right as I managed to get his pants down, he sprayed my arm. AND got his pants wet. The tally so far: Two Wet Kids . . . whose clean clothes were all back in the hotel (yeah, hotel. I don’t camp with newborns, especially with temperature lows in the 20s). By the time we made it out of the wash, it was 7:30. We had originally planned to cook and eat dinner at a picnic area in the park, but we couldn’t do that with two wet kids. We headed back to Torrey, and by the time we had everyone cleaned and changed, it was 8:30, and dark. There was no microwave in the hotel. Brian and I couldn’t stomach the idea of cold cuts for dinner after a day of hiking. The town of Torrey, Utah is small. Very small. So small that most restaurants are closed by 8:30. The fabulous Patio was open until 10:00. We gratefully ordered a pizza and the kids filled out their Jr. Paleontologist books while we waited. This is where the story begins to turn around. For sitting at a nearby table was a pair of women who work as paleontologists for the Museum of Ancient Life at Thanksgiving Point. They came over and introduced themselves. Did our kids like fossils? Did we know that there was a big fossil field just outside of the park? Would the kids like some of the fossils they had collected? 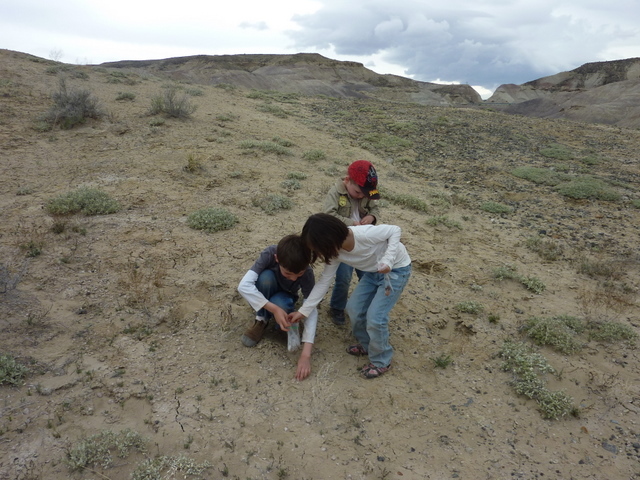 The ladies had a big bag of fossilized clamshell-looking things, commonly known as “Devil’s Toenails.” The kids were THRILLED to have a handful of them, and later in the trip we drove out to find the fossil hill ourselves. 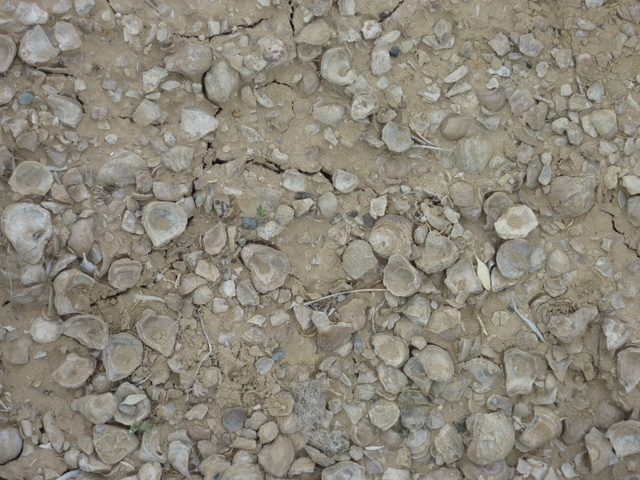 It’s true: a giant pile of fossilized seashells, in the middle of the desert! Can’t help but wonder what long-ago people thought of them. We collected our own bagful. Happy ending, happy ending. Just watch out for those water pits. Highs were in the low 60s, and it was great to shed our coats and go “walking in the top of the mountains,” as William had been begging to do. Best of all, it wasn’t overbearingly crowded. 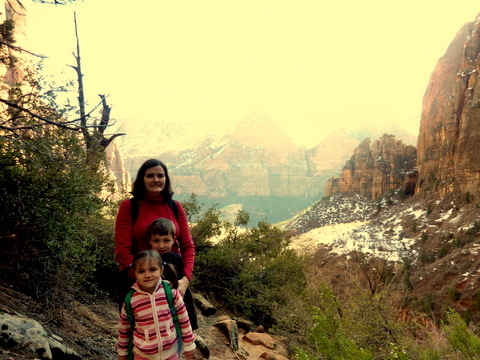 In summertime, Zion Canyon feels like an amusement park, with hikers shuffling through on each other’s heels. During our winter stay the park wasn’t anything near empty, but it was uncrowded enough to give us some nice solitude on our hikes. Brian has declared that he never wants to visit Zion again in the summertime. Hear, hear. The downside of the warm weather was muddy trails. But Eleanor found this rather thrilling. 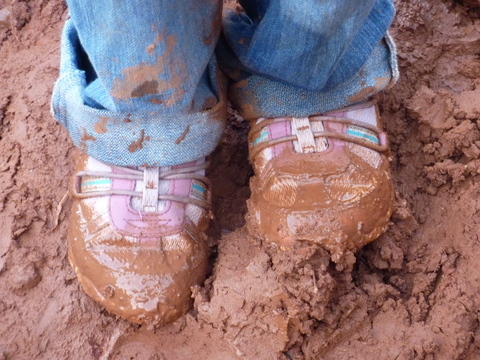 She purposely trod through the thickest, stickiest ruts, singing “Mud! Mud! Mud! Mud!” at the top of her lungs. 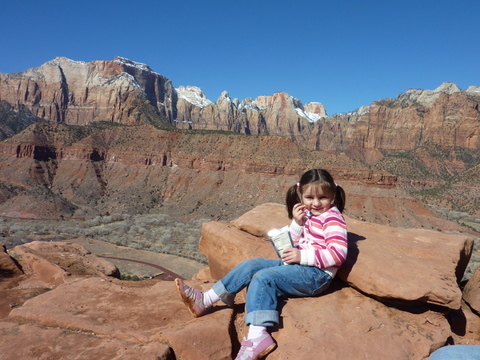 She was such a good little hiker — halfway through our first hike, she turned to us and cried, “Do you know what? I haven’t whined a single time during this hike!” It was true, she hadn’t; Brian and I hadn’t even realized it before she pointed it out. 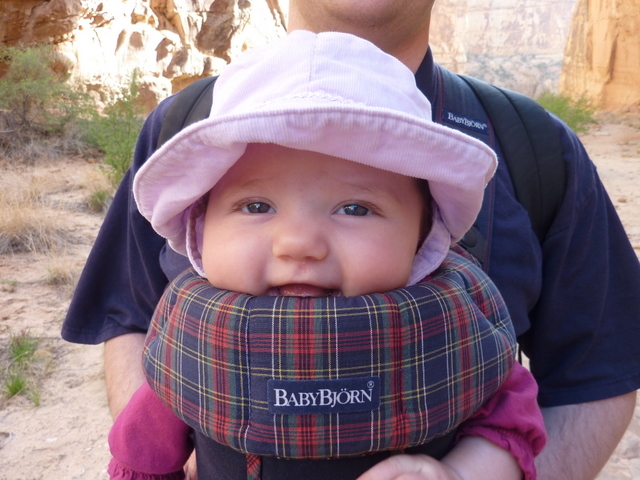 After that, whenever she was about to get cranky on the trail, we reminded her of how she didn’t whine, and she quieted down. Mud! Mud! Mud! Everyone’s shoes got a nice little coat, as if we’d all been dancing in a bottle of Burnt Ochre. One of the trails we chose had a lot of spur trails and no directional markers, so we ended up going the wrong way, all the way to the top of one of the little valleys in the Court of the Patriarchs. It was still beautiful, even if the trail eventually disappeared. 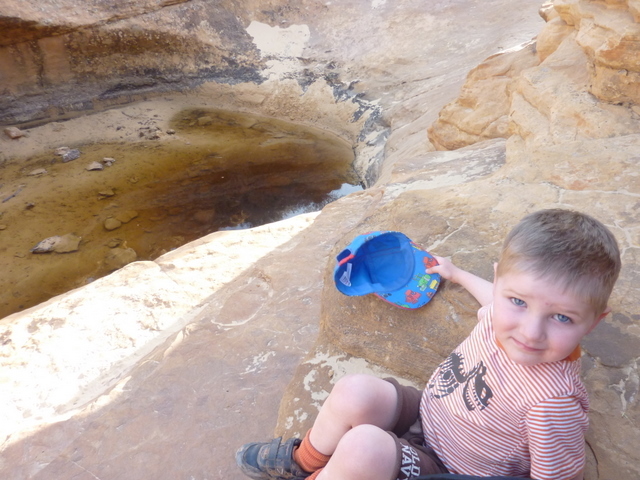 Jeffrey loved the Emerald Pools, so much so that he did not heed our warnings about hiking with wet shoes. Alas and alack. Brian’s dad, Randy, joined us for the Emerald Pools hike (he had caravanned down with us, in order to visit extended family in Cedar City) and was invaluble when it came to holding children’s hands on the steep parts of the trail. At one point, he was occupied holding both William and Eleanor’s hands, and an older, white-haired gentleman who passed us took the time to tell Randy that “you should enjoy them when they are so young like this — they grow up so fast!” Apparently, the white-haired man was under the impression that Randy was the children’s father! Randy decided to take it as a compliment to be taken for a 32-year-old, although when we later bumped into that white-haired man again, he took care to say “Come along, grandchildren” in as distinct a voice as possible. The only real challenge to the trip was finding places to eat for dinner. Most of the cheap restaurants in Springdale were closed for the season, or only serving lunch. But a exploratory drive to Hurricane revealed a Chinese buffet place that was, we thought, a perfect way to ring in the Year of the Tiger. Plus, they had Jell-O. You haven’t really lived, cuisine-wise, until you’ve watched your seven-year-old try to eat Jell-O with chopsticks. In the evenings, we holed up in our hotel and watched the Olympics while munching on microwave popcorn. I don’t know if we got very much rest, sleeping all together in the same room, but we certainly returned to Salt Lake feeling much less stressed.